I wanted to fish but didn't have a set target. I wasn't sure if I wanted to just float or paddle bait out for a big fight. I called Mike Williams from CMJ (Catching Monster Jaws) Shark team and asked him what he was doing. He Said "I'm Bored and want to go fishing." so we met at Bob Sykes Bridge in Pensacola FL. We decided to go for a shark. I had my 9/0 Senator Rigged With Bullbuster 100lb braid attached to a big game swivel , that was attached to 200lb Bulbuster Grander Mono Leader secured with big game crimp sleeves. Mike being a smaller guy said he would run the bait out . I was thankful for that because it was a little rough and dark. Being that I'm 350lbs it just made sense in the name of safety. The bait was out , we had a couple other smaller poles out in case a hungry red swam threw and the bite was slow. We were laughing not paying attention, being loud pretty much chased all the tourist off . We were not rude , but when you are fishing with a cheap grocery store rod. Then people like us show up with heavy roller tips and reels that look like winches , you pretty much know your out fished. It was boring for hrs. and didn't seem like it was going to happen. The air got thick and stale . The wind stalled out. The bugs showed up. It was hot and sticky and just all around miserable fishing conditions. We couldn't stand it much longer and began to pack up out gear and smaller rods and calling the trip as a loss. I woke my son Mason who had fallen asleep shortly after we were setup and had him pack up his chair and his little cooler when it happened. A quick 20 ft run of drag. I was not in position to take the lead but mike was all over it. It had it in its mouth and was swimming with it, but wasn't swimming in the direction we needed to make a solid hook set. Mike waited like Zen Miagi of sharking. The shark ran straight away with the next run. Mike locked down the drag and cranked the reel like he wanted to rip the sharks face off. It was incredible. The Custom Half Hitch Roller Tip bent over and was stead fast. The bull buster gear held true and preformed like magic. This shark was coming in and there was nothing stopping it!. It felt like a good sized monster especially for a inland water way. As the shark tired he began to swim right toward us making it easy for the last leg of the fight . As a team I went and collected anything in our way positioned my son to see the action, grabbed a rope and tied a bowline slip, and waited for Mike to bring the shark to the ledge. When he came into view Mike exclaimed "NICE BULL" we had to lift this shark over a 3 ft concrete ledge to get a picture. 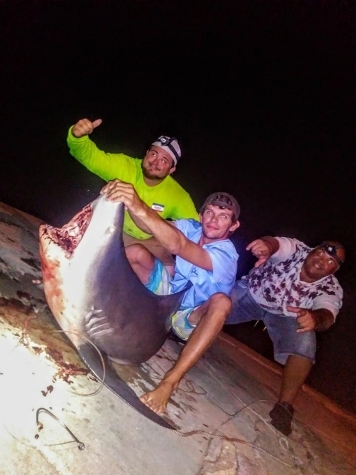 We didn't have a scale but this 7'3'' Monster Bull Shark weight a estimated 200+ pounds after we got the tail roped and pulled him out of the water. What a amazing catch! It was a pleasant surprise to the end of a less then perfect night of fishing. We new we didn't have a lot of time, and we didn't want to kill this amazing creature. So we snapped a few quick pics and got this shark back in the water. It didn't want to swim. I knew this shark wasn't going to last much longer. I jumped into the water and positioned myself behind the right side fin and began walking the large Bull until he began to swim on his own. Knowing this thing would wake up eventually after being revived I quickly pointed his way towards open water and got safely out of the water. You can never tell what kind of fish you will catch and never know what kind of night it will be. But with good company, great gear and quality Trust worthy line from Bull Buster, it always ends in a successful catch. This night outlines what fuels the passion this sport takes, and how great a trophy just a picture can be. Thanks for the memory Mike Williams of CMJ . Hopefully soon I can return the favor.